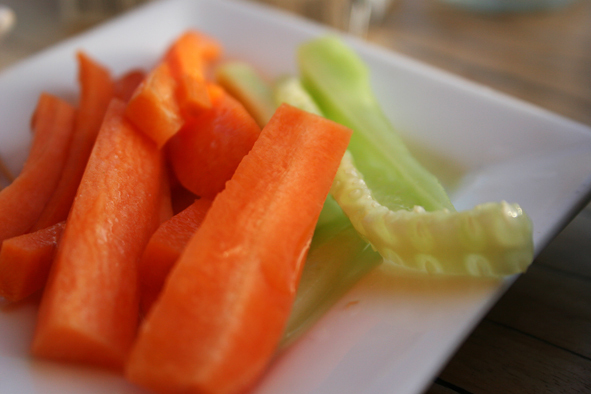 Carrot and Cucumber: Cut vegetables into strips, salt them and serve. If you need enough for an entire party, put the vegetables in ice-cold, very salty brine in the refrigerator, and use when needed. Feta with Honey: Cube the feta, grind over pepper, and sprinkle some Greek honey on top. Feta with olive oil: Cube the feta; sprinkle them with a really good olive oil, dried oregano on top. Cheese with salami: This is found in many countries, but use a Greek cheese and it becomes Greek… Graviera or Kefalotyri are my favourites, both quite hard yellow cheeses with great flavour. Cut them into cubes and attach a small piece of salami on each cube with a toothpick. Pit the olives. Run everything except salt and pepper in a food processor, season with s + p. Let the puree stand for at least a couple of hours to develop flavour. Add a little puree on top of each cracker. The puree can be stored for a long time in the refrigerator. (And to add a completely un-Greek thing: Plenty of butter on the toast – before you add the puree – that is seriously good! This entry was posted in Mezedes. Bookmark the permalink. Click here to visit the most wonderful place in Greece! Nafplio is located about one and a half hour’s drive from Athens, on the Peloponnese peninsula. The beautiful old city has a wealth of narrow alleyways and streets, steep stairs, taverns serving delicious Greek food, lively bars, clubs and cafés, a lovely seafront promenade, and enough sights to fill a week or two. But the best is perhaps just being in this wonderful city, watch the sun go down behind the mountains, colouring the bay red, or relax in the central square and look at the playful children, couples, friends and families enjoying food, wine or frappé - just like you. Click on the photo above to visit Nafplio!